Automatic Voter Registration (AVR) is gaining serious ground in Massachusetts. Automatic Voter Registration (AVR) is gaining serious ground in Massachusetts. Lately both elected officials and constituents have expressed strong support for H.4320, the AVR legislation under consideration at the State House, which currently sits in the House Ways and Means Committee. AVR would automatically register Massachusetts residents to vote when they interact with a state agency, like the Registry of Motor Vehicles or MassHealth. The bill also requires voter contact information to be updated after visits to these agencies, ensuring that all voter data on file is accurate. AVR could help give almost 700,000 eligible but unregistered voters in Massachusetts a voice in our democracy. The Joint Committee on Election Laws gave the bill a favorable report in February. However, because the bill includes some costs, it also requires approval from the Ways and Means Committee and is still awaiting this crucial endorsement. Common Cause Massachusetts recently released a study suggesting that based on data found in Oregon, Vermont, and Colorado, the Commonwealth could expect to incur costs totaling $1 million or less in implementing AVR. The report also clarified that these expenses would have minimal impact on the state’s budget, as Massachusetts still has over $43.4 million in federal funding from the Help America Vote Act waiting to be put to use. Since HAVA funds are meant to assist states with electoral reform, using a portion of this money to pay for AVR is an efficient way to improve elections and voting systems at little cost to the state itself. In March, Massachusetts Secretary of State William Galvin formally and publicly endorsed the AVR bill, stating: “I look forward to working with the Elections Modernization Coalition on the successful implementation of automatic voter registration in Massachusetts and to achieve our shared goal of continuing to increase access and voter participation in the Commonwealth.” House Speaker Robert DeLeo has also expressed interest in AVR and is reportedly “jump[ing] at the chance” to discuss it further. As AVR gains support from public officials like these, Massachusetts moves closer to building a more inclusive democracy. 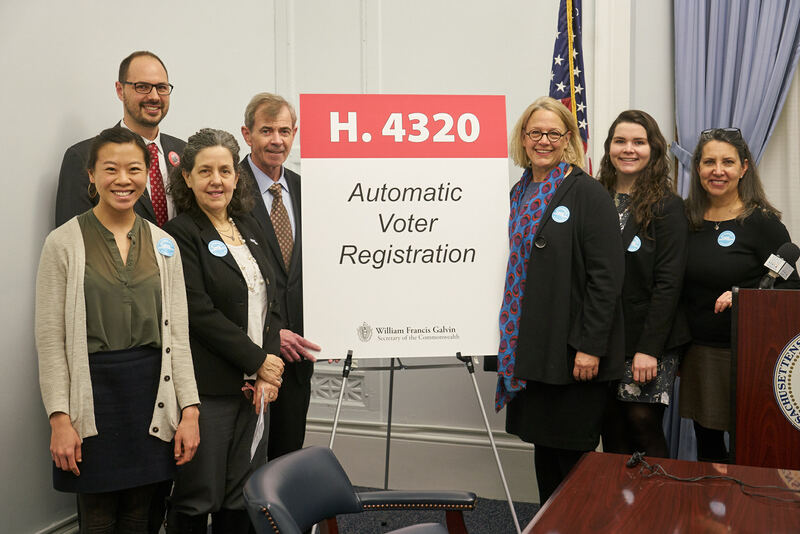 Members of the Election Modernization Coalition pose with Secretary Galvin and AVR’s new bill number. Call Governor Baker and tell him to sign AVR into law! An easy way to tell your representatives, community leaders, and fellow constituents why AVR matters! Have your friends, family, and colleagues fill them out and send them in. Check out your representatives' websites to see when office hours are held. Join our email list to stay informed about AVR volunteer opportunities and legislative updates. Work with other organizations that may want to help pass AVR? Tell them to join our coalition.